Gateway Chapel is a prominent Church in Erith, Kent however the challenge is always to draw new members to the Church congregation. People can drive past any building and not truly know what is inside or indeed what to expect. We needed to help draw attention to the Church, to let people understand who was inside, that they were friendly and approachable and also that they were there to welcome people of all ages and cultures. A 96 sheet billboard outside the Church meant local people would be constantly reminded of the Church’s presence, who the Pastor is and when they could visit the Church. By rotating artwork, and occasionally creating new artwork, the billboard remains a constant reminder to passers-by and locals that their Pastor is there to welcome them. The Church has now gained prominence in the community and is always busy. A strong congregation exists and new members are always visiting. 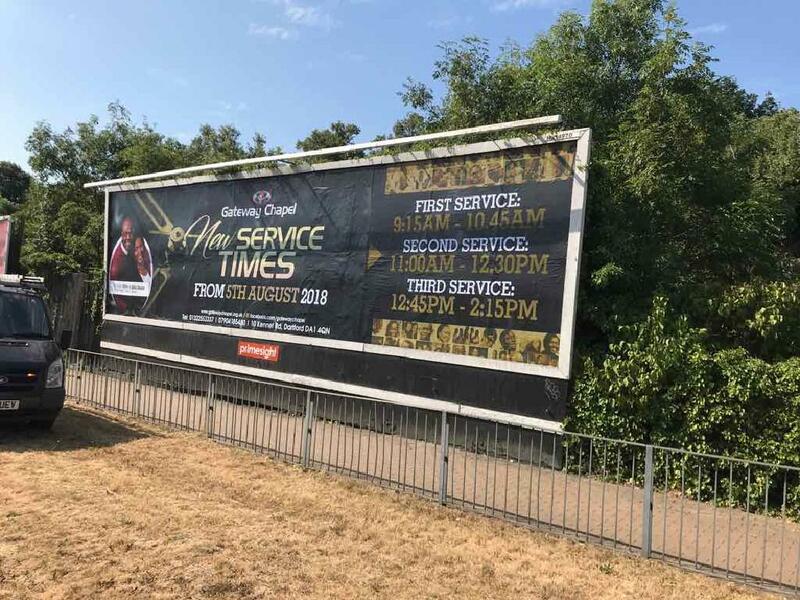 The billboard has become very much a part of the Church delivering news to the members and passers-by and also keeping the Church and Jesus at the forefront of everyone’s mind.